I know the "Part 1" in this post title might make it seem like I'm trying to hook you into a series, but the simple truth is that I can't encapsulate the last two weeks in one post. I'm going to have to break it down into manageable chunks both for time constraints and to keep me from heading into the emotional toilet. I want to record how I've felt and what's happened this month, but at the same time I'm reluctant to revisit everything. Baby steps, I guess. So. Things seemed pretty normal when Amelia and I were released from the hospital on Thursday, Sept. 29th. My hands and feet were a little puffy, but all in all I seemed to be "diuresing," or getting rid of my body's excess fluid, as expected. Grayson drove us home, where my parents and sister were waiting to greet us and help us get settled in. The rest of the day Thursday I felt alright, but around the boys' bedtime Thursday night, I started to get sort of a foreboding feeling. I remembered that when the three boys were infants, every night at sundown I'd get that sort of feeling, like I didn't want the night to come because it seemed to last forever ... the getting up, trying to nurse them, not succeeding, pumping, feeding them from the bottle and then finally falling back into the bed again with only 15 minutes until they would wake up again. (With all due respect, God, that was quite a vicious cycle, not one of Your better ideas.) I've always categorized that malcontent as "baby blues," nothing more. But the feeling I had on the night of the 29th was more disturbing to me. I felt like I was having an out-of-body experience. The sounds of my boys getting ready for bed, the noises Amelia was making in her basket at my feet, even the conversation my sister was trying to have with me ... all of that felt like it was happening in a vacuum, and I was existing just outside of it. Y'ALL. It was so bizarre. When I verbalized it to my sister, she said it sounded like an anxiety attack, which I'd never had before. The way she described my emotions back to me, the more I thought she was right. She ended up talking to me almost all night long, and finally, at about 4 a.m., the anxiety subsided and I fell into a restless sleep. That lasted all of three or four hours, because -- SILLY ME -- I had scheduled the entire family, including my parents and sister, to be downtown for Amelia's infant photo shoot at 9 a.m. In all honesty, the photo shoot went well, we were able to get pictures of everyone, and Amelia was a little angel. After we finished up at the photographer's studio, we had to run Amelia back to the hospital to have her bilirubin checked (we'd scheduled that at the pediatrician's request the day before), and unfortunately that "little errand" took over an hour. By the time we got home again, we were all bushed. The rest of the day was fine; I felt tired but not strange or different than I would have expected at that point. However, when it was bedtime that night, I couldn't fall asleep. I counted backward from 100 several times, I tried to clear my mind completely, I tossed and turned ... nothing could put me to sleep. And then I felt a migraine coming on. It was a little after midnight and it came on quickly. I got out of bed about 12:30 a.m., took my prescription migraine medication and decided to try sleeping on the couch. No luck. Around 2:30 a.m. the migraine felt like it was peaking, so I took another dose of my migraine med and -- knowing two doses was my limit -- moved to the recliner to try to sleep sitting up a little bit. Things only got worse, and the migraine felt distinctly different from my "regular" migraines. It was then that I started wondering if it could be related to my blood pressure. At 3:30 a.m. I went back to our bedroom, woke Grayson up and told him I thought I might be having a blood pressure event ... but I wasn't able to say for sure because I've always been a 120/80 girl. I had no idea how high BP would present itself. Grayson: "Well, we have a few choices. I can call 911 and bring the paramedics here, I can take you to the fire station, or I can drive you to the hospital." Me: [long pause] "I don't think I can get in a car right now." So Grayson called 911 and the paramedics arrived about 10 minutes later. They came stomping up the stairs and into our room, where I was laid out looking especially fetching, what with my stained T-shirt, underwear stuffed with padding for my bleeding vajayjay and my hemorrhoid-infested hiney, and my glasses on. Quite frankly it's a wonder none of them ran away screaming. Despite my appearance, they were complete professionals, informing me that my BP was 181/98. Me: "So what does that mean?" Me: "Is it high enough to be worried?" Paramedic: "It's high, but borderline. Do you want to go to the hospital? We've already called for the ambulance." My Sister: "YOU SHOULD GO. YOU NEED TO GO, KATHERINE." Now picture me levering myself up into a sitting position, what with all my excessive padding and exotic sleepwear. 4 a.m. is pretty clearly not my best hour of the day. I WAS A SIGHT TO BEHOLD. 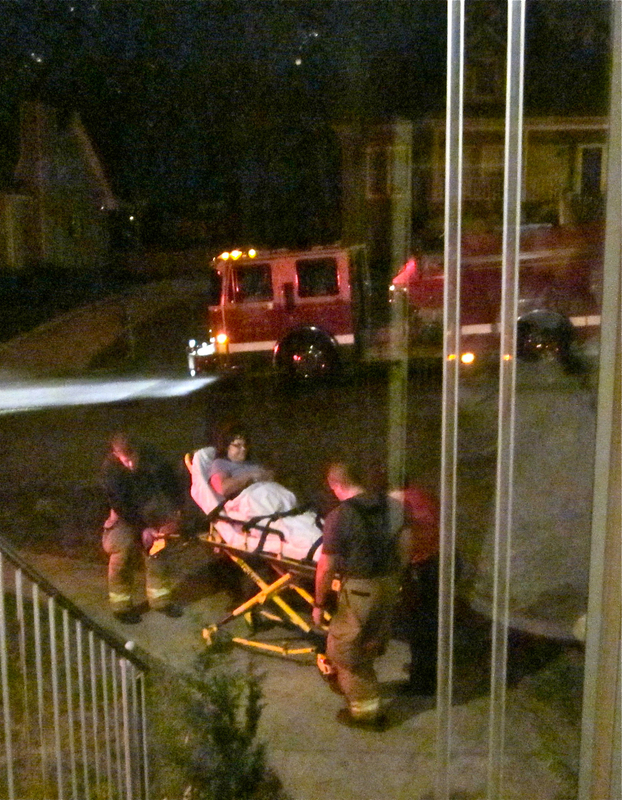 I was able to walk down the steps, where they had a gurney waiting. I climbed on it, and my killer migraine and I were on our way to the hospital, where I hoped they were going to save my life. Geeze, what a beginning! 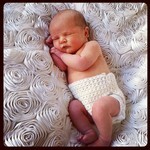 A photo shoot with a newborn...that's just crazy. I had a photo shoot at 3 weeks old for my oldest and hindsight told me that I was crazy and no one else was in the photos! Hugs and hope that all is going better these days. I have two questions: are you using your phone while strapped to the gurney and two- who did you ask to make sure they took the picture as you were being wheeled out. Or did someone just assume you would want that for the blog. For the record- I know EXACTLY what you mean by that nighttime feeling when you bring a baby home for the first few nights. I am starting to have anxiety just thinking about it now. Taking the picture actually crossed my mind but her sister took it. I've had BP issues since right after Jackson was born, and mine always were triggered by a killer migraine, so I know exactly what you are describing. It's so painful and scary. And the foreboding sense before you head to bed with a newborn is terrible. I hope you are doing better now, and don't worry about how much medication you have to take. That's all secondary to you being healthy for yourself and your family. Great storytelling, although you did leave out the hotness of the firemen. I can't wait to read the whole thing, because I don't even know that part! I love you and I'm so glad you're doing so much better. glad you are better and don't worry about the comments on the meds. they have never been there. I am plagued by high BP( 175/150) and immobilizing migraines as well, generally 6 out of 7 days a week is the norm for me. I can totally sympathize, but when I went to the ER all they did was give me IV meds for the pain and send me home; they never ran any tests despite my begging and pleading.It is just a chronic thing I have to live with. Oh, Kat! I am so glad you are doing better. It just made my heart hurt that you were away from your family for so long. I know exactly how you feel with the anxiety. Gosh, I remember just not even wanting it to be bedtime because I only slept in 2 hour increments. I remember sobbing in my bed with all 3 of mine at some point because they weren't latching on, and I was so frustrated. Why don't they tell you about THAT beforehand? Hugs to all of you, and I can't wait to meet Amelia! I was teary-eyed and scared for you as I read this. I'm so glad I know the 'ending' already!